4 Pack Car Seat Headrest Hooks / Universal Vehicle Car Seat Bottle Holder / Hook for Coats, Bags [CAR005981] : Onchee.com - the accessory shop for all your handheld Electronics! 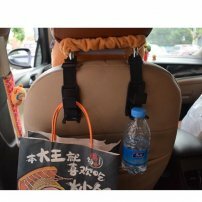 The Car Seat Headrest Hooks is the most affordable and solid car accessory, It’s specially designed to hang groceries, clothes, umbrella, handbags, water bottles, kid's toys, baby supplies and much more. This is one of the best ways to prevent rolling around and spilling your bags in the back of the car. - Customized design fits on the Seat Headrest of Most Vehicles. - Constructed out of premium quality material that each can hold up to 13 lb (6 kg). - Includes a BONUS bottle holder part for each hook to add on the bottom hook to turn it into a bottle holder. - Hook converts your car's headrest into a convenient storage space. - Hook can easily swing around so it can be used for the front or back of the seat. - It’s easy to remove when not in need or changing to another car. - Easy And Convenient To Use. - Hook installs easy with the side opening design so you will not need to dissemble the headrest. - Product Dimensions: 17cm approx.